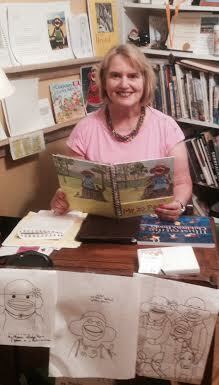 Tutta Greer Cone, Artist/Illustrator lives, paints, and creates in Belle Fontaine, Al. In addition to being a painter she is a mosaic artist and an author/ illustrator of children’s books. Currently, Tutta's Monkey paintings have been sold throughout the United States through Gallery exhibitions in Alabama and Florida as well as word of mouth. She has also painted and shipped numerous commissioned works based on subject matter requested by the clients. Tutta studied art at Queens College in Charlotte, N.C. and later earned her bachelor and masters degrees from the University of South Al. She has been influenced by various artists. In 1976-80 she studied under William Nolen-Schmidt and Russell Hempstead. She credits Nolen- Schmidt her friend, with influencing her interest in and love for color. Other artists she has studied with are experimentalist, Mary Todd Beam, portrait painter, Daniel Greene, Benny Andrews, Watercolorists,Tony Couch and Paul Jackson, and local artists, Val Webb, Susan Hale, and Ken Shaw. Tutta spent 27 years in the Mobile County Public School System teaching young people art. Most of her time was spent in the Semmes community, at Mary Montgomery H/S. She was instrumental in building a Visual Art Center on the front campus at MGM. The center is named for her father, Jack V.Greer.